Many years ago (I think it was around 1974) I was given my star chart and it said that I was a capital A artist, which I was told meant that my “art” was beyond material and that in any case the adequate way to materialize this talent was through volume and so using clay as the material and sculpture as artistic discipline. As a matter of fact, a little bird must have whispered the clairvoyant some information because at that time I was making sculptures. However, I cannot deny that I was full of satisfaction when I was told that and with the fact that, in theory, it appeared in my star chart. 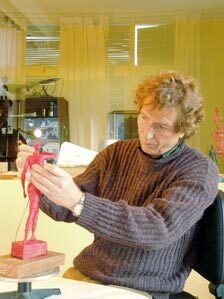 By chance, I started working as a model for a sculptor, Josep Viladomat. During work hours we kept long conversations about art, the bohemia in the Barcelona of the 30’s, about the Paral·lel and the Ramblas (boulevards in Barcelona well known for its artistic venues), about clay, drawing and sculpture. Viladomat began teaching me the profession: the modelling of the clay, mainly, and also the proportions, the inlay and joining, the moulds, etc. We would talk about reference sculptors: Maillol, Rodin, Casanova, Rebull, Monjo, Hugué, Gargallo, and González and about the brilliant Michelangelo. We never went further the classical figurative models. In his opinion, Moore, Brancusi, Giacometti or Chillida did not make sculptures. They made forms. 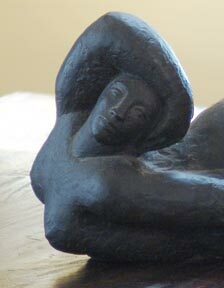 I have been a sculptor for more than twenty-five years now. After all this time the profession shows. People learn and, essentially, people learn from mistakes. I found out that the small format allows one to explore and evolve without excessive anguish, to try new forms and shapes and check if they are liked. In general terms, we can distinguish two types of sculpture. 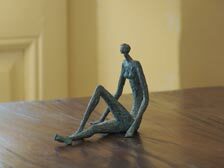 The first type would be the modelling sculpture, which employs smooth materials such as clay, wax or plasticine in order to create a form that will later be reproduced in a more stable material like bronze or stone, through technical procedures. 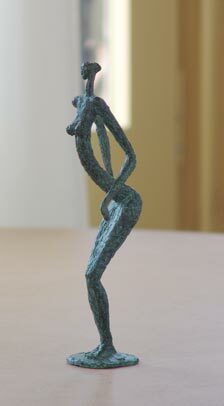 Usually, modelling sculpture makes more use of capricious curves and volumes because the material allows for it. The second type would be the constructive sculpture, where the plan to follow to do the work is obtained from a drawing, in which the lines will always adapt to the possibilities of the materials that will be used. In this case, the artist works with metals like iron and the shapes are mostly flat and the curves are cut-shaped or regular. Another way to classify would be based on the topic, according to which there is figurative and not figurative sculpture. In this classification the limits are much more subtle for there can also be the classical figurative type or figurative approximations or distortions. At all events we can differentiate between the organic and inorganic modelling. I consider my work as a distortion of the organic figurative. 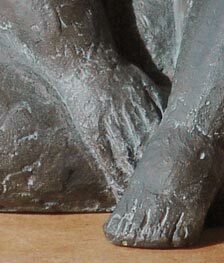 If a mould has been done, bronze allows making more than one reproduction of the same piece. This is very convenient due to the lower costs and the easier reach to people. A unique piece is usually considered to be a collection of up to eight or ten pieces. Serial work means an advantage over unique work because reproductions can be done in a system similar to the one used in lithographies or graphic artists engravings and thus can better approach the work to the audience. The founding is done through the procedure of the lost wax. Every small bronze comes from a wax piece, resulted from the mould, which has been individually founded. This fact adds to more uniqueness. However it is very difficult, although the artist and the founder are experienced professionals, that all pieces are the same, since the metals are heated under more than 1,300ºC and this process always has a magic and unforeseeable something. Besides, I also work with stone, which allows for mainly two ways of working. The first one starts with a previously created model, the forms and dimensions of which will be transferred to the stone by chipping it. The second one is completely based on improvisation and finding out what comes out of the stone by working on it without any planned objective. The sculptors usually keep in mind that our drawings need to be translatable into three dimensions. My favourite topic is the woman. Since the beginning I have represented mostly women. A woman’s body is full of curves and sweetness. I enjoy modelling the personality of each part of the body as if it was alive, as if it had a soul. I like to describe feelings through sensual expressions. Once you have the idea in your mind or the drawing in front of you, the sculpture can be started. Usually, the piece is built in small format. Starting from a rigid structure which serves as a support for the clay or wax. This is the skeleton of the final piece and it is already fundamental to define the desired gesture and to make it with the right proportions. The next step is modelling. This is done by adding material until the planned volumes are achieved. In the modelling technique it is always possible to add or remove material. Both clay and wax are ephemeral materials. 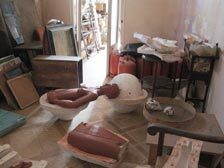 One the piece has been modelled, it is necessary to make a mould for the later reproductions in bronze. Serial and numbered work in small format is very close and personal. It can be located in any place and its presence is quiet. It is there, but discreetly, like music in the background of films. Knowing that there are people who have small sculptures made by me that become a part of their universe fulfils me.